Hi everyone, I am Al Roth and I recently moved to Minneapolis with my wife Lynn to help her take care of her mother who has MS. God has truly blessed me with being a difference maker in the lives of others, so when my wife asked me to make the change I didn’t have a problem with it. 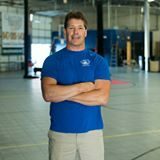 I’ve owned 4 different Health Clubs and Training Facilities in Illinois and love the idea of just training others. I have spent countless hours working with clients of all ages, both young athletes, and adults ranging in the ages of 12 to 97. Seemed a little hard to believe but both athletes loved me for the results they received and the seniors I have worked with in the past all loved me for showing them the time and respect they deserved. That is why I like working out in people’s homes or at my own training place. I love the privacy I can give people to help them totally understand the exercises performed and the muscles that are used for each exercise performed. I believe that it's the little things you do daily will get you the results you desire! Each client I deal with is different so we will have to wait and see what their evaluation shows. When I start with a client I tell them up front if they are not happy with my service, they can have a total refund. FYI: I have never been asked for a refund! Results are my business. I met Jared when he stopped by one of my gyms. He was 540 pounds when he informed me that I previously knew his father and asked if there was anything I could do. Being a doer, I said, It was really up to him and what kind of goals he wanted to set. We didn’t set a specific weight to go after, just that he was to report daily for his workouts and we would go from there. Because of his health, and extreme weight, I started out with him very slow, building momentum little by little. Well, I lit a fire that started burning and he was at my gym everyday for the next 18 months. I stressed with him that it was the little things you do daily that will get you the results you desire. He ended up losing #340 pounds. Then to top it off, one of my clients who was a plastic surgeon offered to cut the excessive skin away. 18 surgeries and two years later he weighed a total of 180 pounds. I love animals and the outdoors too!